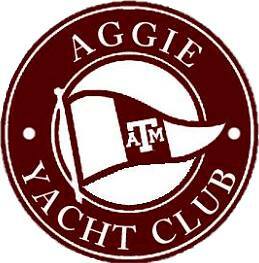 Welcome to the Aggie Yacht Club! If you're an Aggie (or community member) interested in sailing, you have come to the right place! We are a Student Organization of Texas A&M University that teaches Aggies how to sail, how to improve their seamanship, and how to have fun on the water while staying safe. We accept new members of all skill levels, from beginner to hardened seafarers! Join the members of the Aggie Yacht Club for a fun day of sailing, food, and campfires before spending the night by the lake! Enjoy an afternoon sail with AYC and Brazos Sailing Club. We will have a potluck dinner on the lake before sailing back under the light of the moon. We are excited to announce that we have new merchandise available for purchase on our Marketplace store! New hats and long sleeve t-shirts just in time for Christmas! ​Click HERE to visit store!